NASA launched a new satellite – the Soil Moisture Active Passive (SMAP) – which will measure the amount of moisture in the first two inches of soil around the world. The satellite will take measurements every 2-3 days for three years, giving scientists a better understanding about how water and carbon circulate. Soil moisture variability is currently poorly understood, but is key to understanding and predicting weather and climate. This data will enable more accurate monitoring and forecasts of weather, climate, agricultural production, floods, and droughts. NASA has also released maps of agricultural planting and fallowing in the Central Valley. Using data from NASA satellites, NASA produced maps showing changes in crop cultivation between 2011 and 2014. In the image, brown pixels represent lands that were fallowed between January and August of that year, while green pixels represent lands that had at least one crop planted. Some of the most obvious changes are in the areas around Sacramento and the western side of the San Joaquin Basin. The Department of Water Resources submitted an application to the US Army Corps of Engineers to install a salinity barrier in the delta if drought conditions continue. The department installed such a barrier during the 1976/1977 drought and had plans in place last year to construct salinity barriers, although these proved unnecessary following late season precipitation. The State Water Resources Control Board issued a notice to water rights holders that their allocations may again be curtailed this year. The Board also issued a review of its water rights implementation system; the report focuses on recommendations to improve data collection, analysis, and reporting. 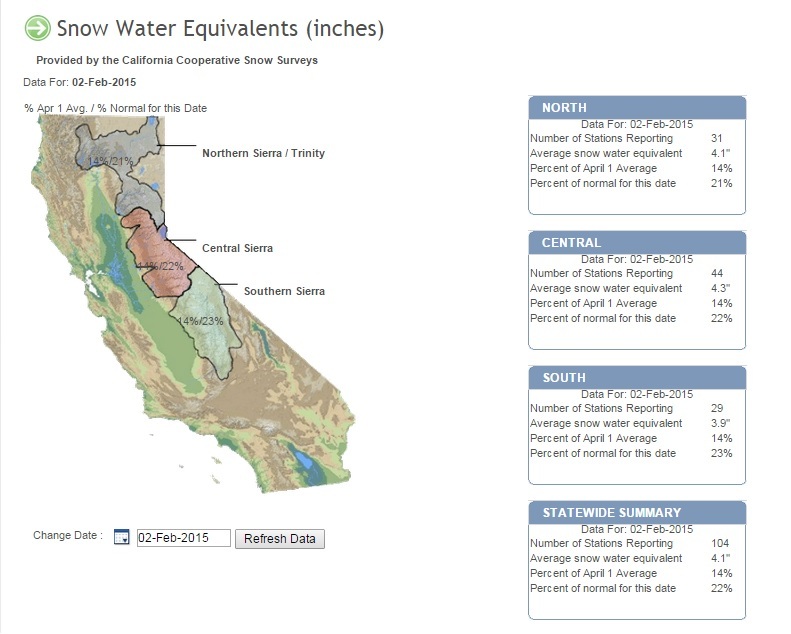 The Department of Water Resources has conducted the second manual snow survey of the year, finding a “dismally meager snowpack for a drought-stricken state.” Snow water equivalent in the state is 22% of normal for this time of year, down from 36% two weeks ago. NOAA satellite images show a greener northern California with visibly less snowpack than previous years. Drought conditions are mostly unchanged this week. 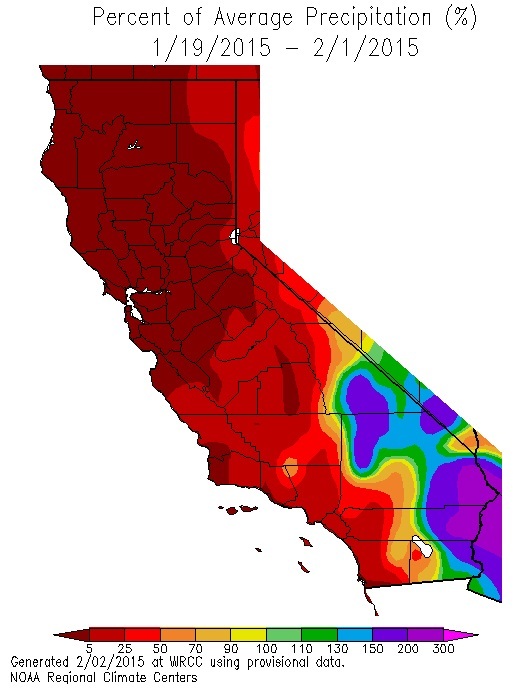 Average precipitation has been below normal for the past two weeks in most of California, except for areas in the most southeastern part of the state. 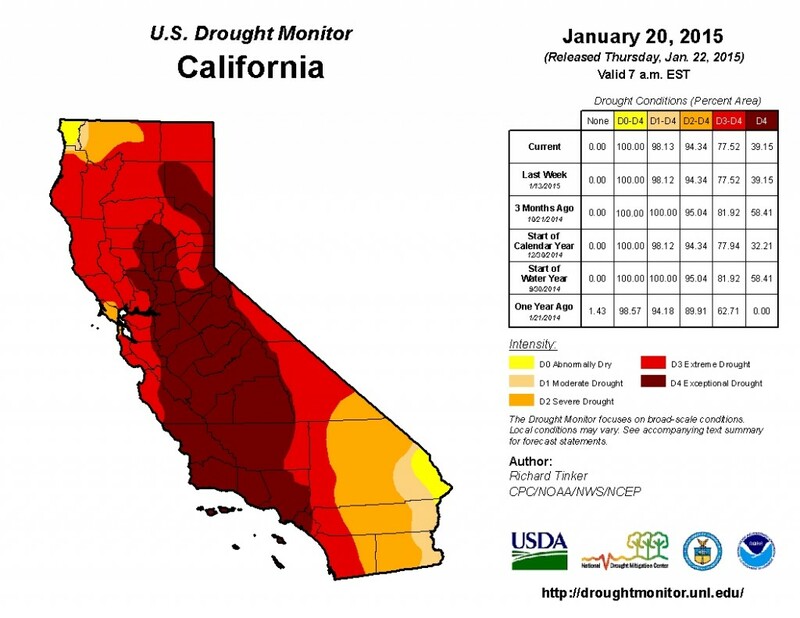 Indeed, January was one of the driest on record and San Francisco’s first January on record with zero precipitation. 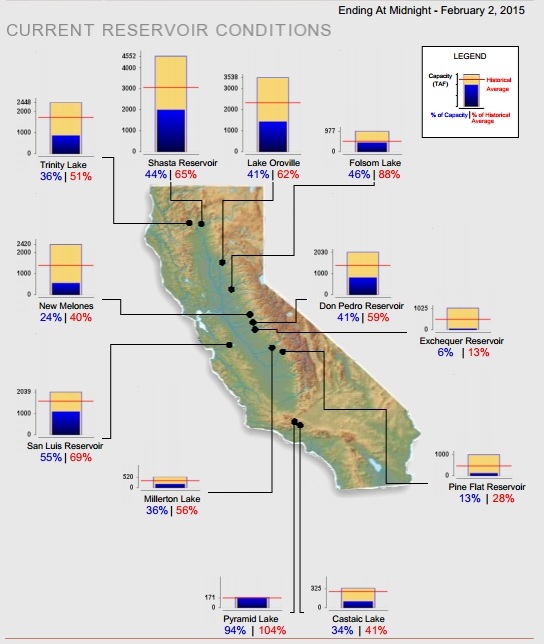 Statewide, California’s major reservoirs (representing 26.6 million acre-feet of storage) are at 38% of capacity and 60% of normal. 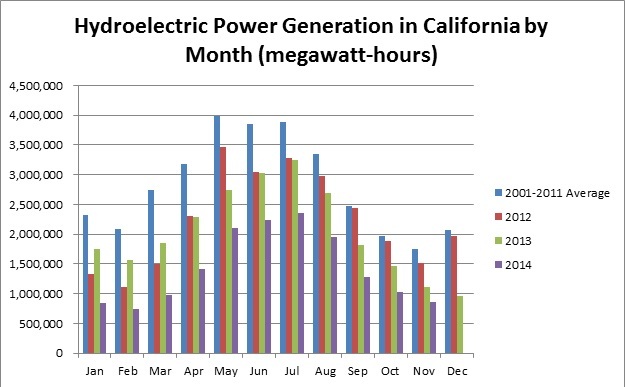 The U.S. Energy Information Administration released the Electric Power Monthly report for November. November generation was 78% of last year and 50% of the 2001-2011 average.